Because global commerce and the smooth functioning of international affairs depend on the free movement of goods and people at sea, maritime piracy has generated substantial concern. Though the number of reported piracy incidents worldwide fell for the second consecutive year in 2013, ongoing anti-piracy operations are costly; pirate attacks have become more frequent and violent in some regions; and it is unclear that the recent reduction in piracy is sustainable. Additionally, with approximately 90% of the world’s goods traveling by sea, skyrocketing insurance and transportation costs, and a shipping industry already struggling with the global economic downturn, piracy’s adverse financial consequences may be even greater than its security effects. Combating piracy is especially important for South Korea because its sizable maritime fleet must regularly traverse two to three pirate hot spots, even for essential energy resources like oil and liquid natural gas.1 If Korea’s central role in the global shipping industry is considered, the problem is even more pressing. This issue brief provides an up to date assessment of maritime piracy and terror and offers concrete policy recommendations for Korea and its neighbors as they approach this complex problem. We begin by describing the recent trends in maritime piracy and international counter-piracy, highlighting Korea’s ongoing contributions to multilateral military operations and its vulnerabilities at sea. We argue that while Korea is an active participant in counter-piracy operations, some low cost, high reward strategies could be implemented closer to home that would further improve maritime security. Moreover, while the Korean people are concerned about piracy, a sizable share of the public believes that the government could be doing more. Like other non-traditional threats, maritime piracy resonates with the public because of its human dimension. Piracy is not a large, existential threat to national security, but it routinely victimizes real people and adversely affects Korean business and industry. This suggests that additional, and perhaps better publicized efforts — especially in Southeast and East Asia — would be well received. Today, most headlines regarding piracy tout its rapid decline. And while this is true, the global rates belie some of the regional patterns. The substantial recent drops in global piracy are mostly attributable to the decline of Somali piracy, which, according to the best data available, reached a high of 236 attacks in 2011 and fell to 15 in 2013. The trends in Asia are not as promising. Attacks in problem areas like the Straits of Malacca and Singapore Straits have declined, but the International Maritime Bureau’s Piracy Reporting Center counted 108 incidents of piracy and armed robbery against ships in and around Indonesia in 2013. All told, last year over half of reported global piracy incidents were in East and Southeast Asian waters, and regional attack rates there have exceeded 100 since 2010.2 Although many of these attacks are opportunistic petty thefts, hijackings persist in and around Indonesia and Malaysia. Additionally, the line between piracy and terrorism is unclear because insurgent groups in the region sometimes use piracy to fund their operations and to traffic in weapons and drugs. In recent years, the international community mounted an overwhelming response to maritime piracy in East Africa and regional partnerships have helped to stem the once thriving pirate syndicates in the Straits of Malacca and Singapore Straits. However, dangerous new pirate prone regions have emerged, most notably in the Gulf of Guinea off of the Nigerian coast and in Indonesian waters in Southeast Asia. Shifting counter-piracy resources toward these new threats is reasonable, but it will also likely restore opportunities to pirate in regions where the international presence is reduced. As of late 2013, six flag vessels were operating in service to the Combined Naval Task Force 151 (CTF-151). At their height, more than 50 ships were active in multilateral counter-piracy efforts in the Gulf of Aden and off the coast of Somalia. The costs of maintaining high numbers of naval assets in East Africa is expensive and difficult to justify if attempted pirate attacks remain at their current low levels. Many countries have already shifted their attention to the more violent attacks targeting the oil industry in the Gulf of Guinea. Some counter-piracy experts have cautioned, however, that Somali piracy will likely rebound as a result of the lessened deterrent. In contrast, ongoing counter-piracy operations in Southeast Asia have not stymied double-digit increases in the number of attacks there. 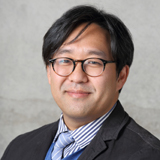 While attacks in the region are not usually as sophisticated as the Somali attacks, their proximity should make thwarting them a priority for Korea and its neighbors. South Korea has made substantial contributions to counter piracy operations at sea and on land, especially in the Indian Ocean and Gulf of Aden. Currently, Korea operates an independent, naval counter-piracy mission and participates in CTF-151, which works in conjunction with the NATO and EU operations in the region.3 Further, as of August 2012, South Korea was the second largest contributor, after Japan, to the Multi-Donor Anti-Piracy Trust Fund, focused on land-based counter-piracy strategies in Somalia. Closer to home, Korea is also a key participant in the Regional Cooperation Agreement on Combating Piracy and Armed Robbery against Ships in Asia, or ReCAAP. South Korea has a proud maritime and naval history and shipping remains an important national industry. Perhaps the most widely recognized symbol of Korea’s maritime prowess is the first indigenously constructed iron-armored battleship referred to as the Turtle Ship (better known as Kobukson). The ship was first designed by Admiral Yi Sun-sin during late 16th century to defend the Joseon Dynasty from invasions by Toyotomi Hideyoshi’s Japanese navy. Today, Korea is better known for being home to some of the largest shipbuilding companies in the world, such as Hyundai Heavy Industries, STX, Samsung Heavy Industries, and Hanjin Heavy Industries. For this reason, it is no surprise to anyone that after China, South Korea is the largest shipbuilding country in the world. Korea’s shipping transport industry is less pronounced but still significant. According to the Institute of Shipping Economics and Logistics latest figures, South Korea is the fifth largest shipping nation in the world (using deadweight tonnage (dwt) as the prime metric) with bulk carriers accounting for the largest share of shipping volume (62.6%) followed by tankers (24.3%) and container vessels (9.3%).4 From a domestic economy standpoint, the Korean shipping industry employs over 20,000 individuals and posted revenue of KRW39.6 trillion (equivalent to about US$39 billion) in 2010. In 2012, there were about 600 outgoing cargo ships, which account for over 900 businesses. While the shipping industry is not as large as automotive or electronics, it does account for a significant share of the economy. Estimating piracy’s impact on Korea is difficult for a number of reasons. Foremost among them, most information regarding costs is proprietary and closely guarded. So, for example, none of the companies contacted for this report were willing to comment on the record about the increased costs of insurance even though it is well known that the shipping industry has been subjected to significant rate hikes due to piracy.5 Piracy’s direct costs are also closely guarded by companies that have had their vessels hijacked or have paid ransoms. For some time, the reported US$9.5 million paid to secure the Samho Dream’s release from Somali pirates held the record for the highest ransom ever paid. Some companies are concerned that they will be accused of supporting terrorism with ransom money while others worry that the proliferation of information will increase the costs of future attacks. Their fears are not unfounded. In some parts of the world, like the Gulf of Aden, reporting is now quite good, but in others it is less so. The risks to South Korea’s national interest are most pronounced when we think about the country’s energy dependence on the Middle East. Oil and natural gas makes up more than half of all total primary energy supply for South Korea.7 According to the latest figures, South Korea imports approximately 98-99% of its oil and natural gas. Of this share, Middle Eastern countries accounted for about 84% of oil imports and 54% of natural gas imports in 2012.8 Although Korea plans to reduce its energy dependence by increasing domestic nuclear power production and by increasing coal imports, the Middle East will remain an important source of energy in the years to come. The hijacking of any one tanker, or even a handful of tankers, does not pose an acute security threat to Korea. Rather, the threat is primarily economic. The costs of transporting energy rise with the threat of piracy, and not only due to increased insurance. In piracy prone areas, additional costs arise due to increased time and distances from rerouting; due to larger crews to stand watch; due to delays from incident reporting and investigation; and occasionally due to increased salaries for at risk crewmembers. These costs are passed on to the government, business and industry, and ultimately, to the consumer. In order to explore public perceptions of maritime piracy, the Asan Institute for Policy Studies conducted a public opinion survey on November 8-11, 2013. While few individuals have direct (2%) or indirect (18%) ties to Korea’s maritime industries, a significant portion of the public nevertheless appears to recognize the risks of piracy. Approximately 63% of respondents agreed that maritime piracy and terror is a serious problem for Korea. It is interesting to note that a majority perceives a significant piracy threat from all hotspots, including West Africa, even though Korean ships are mostly targeted in East Africa and Southeast Asia. 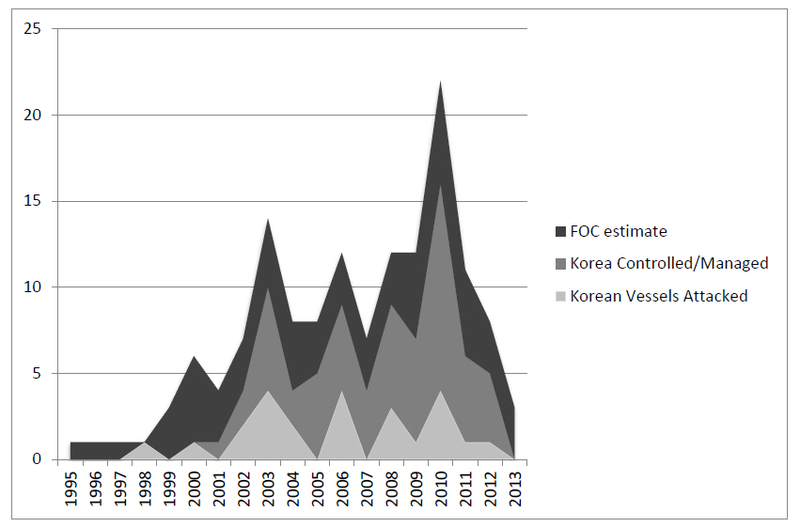 Together, what these findings suggest is that the Korean public generally perceives maritime piracy to be a serious problem even though they have little to no connection with the maritime industry. In considering which authorities should be tasked to combat piracy, 48% of the public thinks that the United Nations should play the leading role, followed by the targeted ship’s country of origin (13.4%), and the pirates’ country of origin (12.9%). The public also seems to approve of the cooperative approach to counter-piracy that the Korean government has pursued thus far. When asked, “do you think that our government has actively participated and cooperated with the international community to deal with maritime piracy/terror,” 47% answered in the affirmative and 29% answered in the negative. A significant portion, however, also thinks that the government can do more about this issue. When asked, “do you think that our [Korean] government is doing a good job of handling maritime piracy/terror?” 41% answered in the affirmative and 39% answered in the negative; a statistically insignificant difference.9 Given the substantial support for multilateral efforts, some of the negative response may be due to the government’s perceived mishandling of high profile hostage situations. For example, some have criticized the government’s inaction or refusal to negotiate ransoms – leaving the hostages on their own or at the mercy of the employers, insurance companies, and the pirates. One lesson may be that the government should better publicize its strategy or explain the logic behind its unwillingness to negotiate with terrorists or pirates. Korea is currently engaged in counter-piracy operations on a number of fronts and those strategies have generally been successful. However, given the current trends in piracy and the relatively limited geographic scope of most counter-piracy operations, a number of complementary policies could be implemented. First, it is apparent that ships that are Korean operated or Korean owned, but operating under a FOC flag make up the majority of Korea’s victimized vessels, but escape notice in most tallies of piracy. It is likely that these ships are victimized because they are not required to adhere to strict labor, safety and environmental standards like Korean-flagged ships. But these vessels become a Korean problem when their crews – including Korean nationals – experience violence, have their personal goods stolen, or become hostages. In order to better protect Korean citizens at sea, the government can utilize greater oversight when it comes to standards and enact sanctions against those companies unwilling to obey Korean laws and bear their fair share. One approach is to institute a heavier fine or penalty for using FOCs for vessels that do not adhere to a more strict international safety standard. An example can be found in the US Maritime Transportation Security Act (2002), which requires vessels and port facilities to submit a detailed security plan. The fine for non-compliance under the MTSA is USD 25,000 per day with the possibility of operation suspension. South Korea may also adopt measures that discourage the use of FOCs altogether by raising the overall cost of engaging in this practice through increased inspection of FOC vessels for compliance under international safety standards. Ongoing maritime disputes have also unduly limited Asian states when it comes to combating non-traditional threats like piracy. When compared to other regions with high rates of piracy, East Asia has comparatively less anti-piracy cooperation, policy coordination, and worse reporting. This is because regional governments have sometimes opportunistically utilized counter-piracy and defensive naval operations as facades to obscure ulterior motives, and drawn their peers’ suspicion. The mutual suspicion has limited coordination and cooperation, leaving significant gaps in patrol coverage. Therefore, many piracy incidents go unreported or are reported too late. Fortunately, these problems can be overcome. Governments in the region should resist muddling their mutual interest in combating piracy, trafficking and other seaborne crime with their maritime and territorial disputes. Clearly separating these two issues will ease cooperation between East Asia’s states and ensure complete defense and more accurate reporting. Long-term, cooperation on these mutual threats may even have positive consequences for productive engagement on more sensitive maritime issues. Finally, Korea must be vigilant in training its seafarers and fishermen in the best available security practices and should encourage defensive measures to harden vessels and protect the crews onboard its vessels.11 Implementing these strategies is straightforward, economical, and can be achieved with relative ease. Resources traveling from the Middle East and must pass through the Straits of Hormuz, the Indian Ocean, and the region surrounding the Malacca and Singapore Straits. At the time of this writing, South Korea was also in discussions with the European Union regarding additional, naval counter-piracy cooperation. ISL (2012) Shipping Statistics and Market Review, Vol. 56, No. 11. A December 2010 report by the One Earth Foundation says that 460 million to 3.2 billion USD per year has been paid in increased war risk and kidnapping and ransom insurance – though in the last three years there is some reason to believe that these costs have declined slightly due to increased competition within the industry. Merchant marine numbers are current as of 2010 and come from the CIA World Factbook at https://www.cia.gov/library/publications/the-world-factbook/rankorder/2108rank.html. The attack estimates were generated using the same method as Figure 1.
International Energy Agency. Energy Policies of IEA Countries – The Republic of Korea (2012 Review). The margin of error at 95% Confidence Interval (C.I.) is ±3.1%. Detailed information on the best management practices (BMP) for the Horn of Africa have been circulated by the EU at http://www.mschoa.org/ and most are applicable to counter-piracy in Southeast Asia. 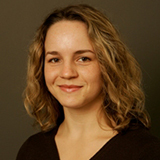 Bridget L. Coggins is an Assistant Professor at University of California, Santa Barbara. In 2007-13, she was the Assistant Professor of Government at Dartmouth College. She was also an Asan-CFR Fellow at the Asan Institute for Policy Studies in 2013. Her work has explored secessionism, maritime piracy, terrorism and insurgency, rebel diplomacy, and the economics of sovereignty. Her first book, Power Politics and State Formation in the 20th Century is forthcoming with Cambridge University Press in 2014. Her research also appears or is forthcoming in Foreign Policy, International Organization, Journal of Conflict Resolution, Journal of Peace Research, and at various university presses. She received her B.A. from the University of Minnesota and Ph.D. from Ohio State University.